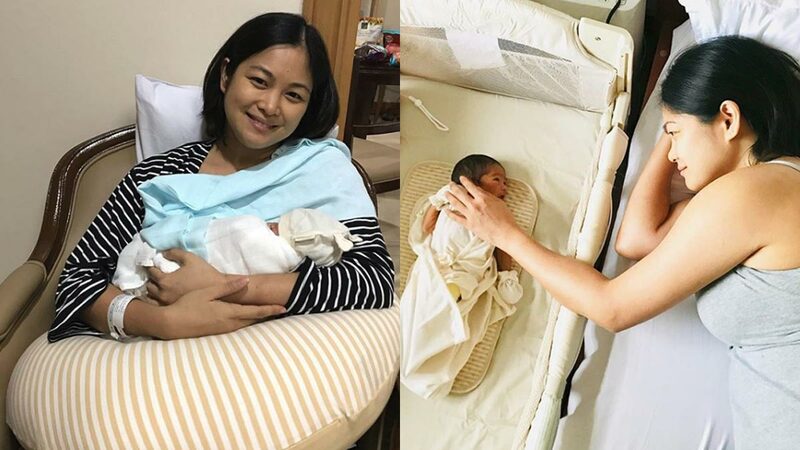 Miriam Quiambao recalls her "supernatural childbirth"
Miriam Quiambao, 43, blissfully nurses her newborn son, Elijah. Miriam Quiambao, a new mom to three-week-old Elijah, recounts her "supernatural childbirth." The 43-year-old TV personality was initially scheduled to give birth to her son Elijah yesterday, March 12, but God had other plans. She and her husband Ardy Roberto welcomed their son on February 16 instead. Blissfully nursing her newborn, the beauty queen-turned-inspirational speaker related in her latest Instagram post how the arrival of Elijah happened in "God's Perfect Timing." Her post read, "I was supposed to be scheduled for CS today, March 12, 2019, about week before Baby Elijah was due but for some reason God sent him almost a month early and was born last Feb. 16, 2019, just a couple of days after Valentine’s day. "It has been a little over 3 weeks since and I’m still in awe about how the Lord orchestrated his arrival. "My doppler ultrasound was scheduled on a Monday, the same day my OB @dr.beckysingson was scheduled to leave for Japan. "By some divine leading, she decided to have a doppler ultrasound a few days earlier where the sonologist found out that my amniotic fluid level was too low. "My doctor then decided that I should undergo an emergency C-Section that very Saturday before the baby becomes distressed which could lead to him being stillborn. "It may have seemed a month too early but it was God’s perfect timing—the supernatural childbirth that I was praying for. "Now I am blessed that I can cradle him in my arms to stare at his beautiful face. "Oh what perfect gifts from above!" Miriam and Ardy announced that they were expecting a child on August 19, 2018. The couple had been trying to have a child for four years. In her pregnancy announcement post on Instagram, Miriam revealed that they were already considering adoption or in vitro fertilization as an alternative. But through the grace of God, "He rewarded our faith with the greatest gift: a baby concerived naturally!!!" Miriam faced some challenges along her pregnancy journey. During her 25th week, she was diagnosed with Obstetric Antiphospholipid Antibody Syndrome, an autoimmune disorder. On her 30th week, she revealed that her baby was "too small for his age" because her placenta was "thicker than normal, causing reduced blood flow to the baby." Then weeks before Elijah's due date, Miriam and Ardy were already advised that they might give birth to a premature baby. Despite the odds, Miriam had a safe delivery. Before Elijah, Miriam has known the joys of motherhood through her stepson, Joshua, Ardy's son with his late wife Tingting.